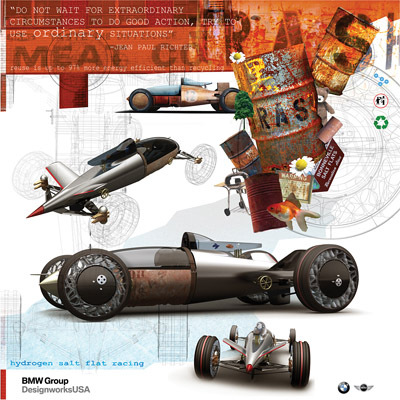 For the 2008 LA Auto Show Design Challenge competition BMW designed a hydrogen powered salt flat racer based on the premise of reuse (instead of recycle). 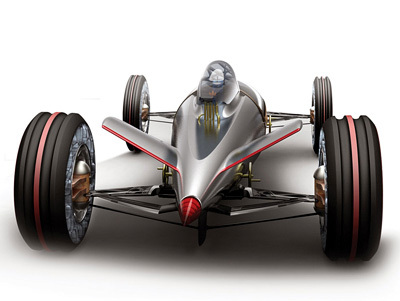 By using existing, ordinary, and mundane materials, such as old oil barrels and barbeque lids, as main components for the body and wheel discs of the vehicle, BMW have tried to make the concept as environmentally friendly as possible. 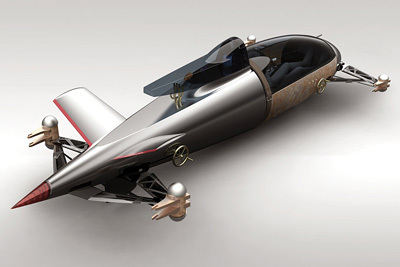 Friendly, whimsical and sustainable, the concept employs goldfish as "co-pilots" or "canaries-in-a-coal mine" to ensure that the vehicle is running clean emissions (if your fish get sick, you must be running "rich"). 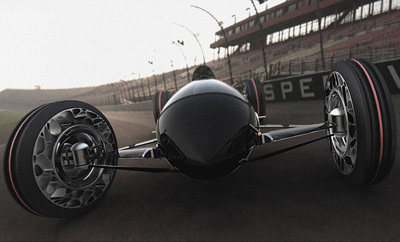 The wheels are gel-nylon for necessary flex, allowing tires to be airless and re-vulcanized or re-treaded.